Chelsea made it a club record 12-match unbeaten league start as their dominant win over 10-man West Brom extended their lead over Southampton, who play Aston Villa on Monday evening, to seven points. Manchester City beat Swansea to remain eight points behind in third, while Manchester United moved into the top four with victory at Arsenal. At the other end, Burnley moved off the bottom with victory at Stoke. Following the weekend's action, take a look at my team of the week and see if you agree with my choices. I sat in the post-match press conference at Stamford Bridge and listened to the interviews from messrs Jose Mourinho and Alan Irvine about how well the Albion did in stopping a Chelsea onslaught. How strange then that neither man mentioned Ben Foster, who was responsible for keeping the score line respectable. Remember there has been an 8-0 at Stamford Bridge before now and, had it not been for Foster, what looked like a routine defeat might have been considerably worse. What an asset Antonia Valencia has proved to be for Manchester United. I remember when he was a very exciting Wigan player with huge potential. It would seem that he realised all of that as a winger under Sir Alex Ferguson, but he seems to offer Louis Van Gaal another solution at full back. His performance against Arsenal was full of running and he has the intelligence and ability to fulfil the problematic right-back position on a permanent basis. This lad was thrown into the deep end at Manchester United and left to swim to safety, and there were times when I thought he looked like he was drowning. But his defending against Arsenal was of the highest order and had to be to withstand the constant bombardment from the Gunners. A performance like this will go a long way to providing the confidence he needs to fill the shoes left by Rio Ferdinand and Nemanja Vidic. 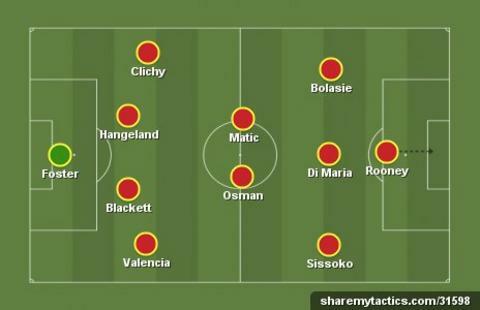 On this showing Van Gaal can afford to be a little more patient and not to be so desperate to get a centre back in January. On this evidence this lad deserves a chance. Although Neil Warnock can't take the credit for bringing Brede Hangeland to Selhurst Park, he can take the credit for getting him back to the sort of form he was showing under Roy Hodgson at Fulham. He came on after 36 minutes and was rock solid at the back for Palace and a complete nuisance for Liverpool at set pieces. Instrumental at keeping Brendan Rodgers's side at bay. Gael Clichy has never scored for Manchester City but, had it not been for a fantastic fingertip save by Lukasz Fabianski that pushed the ball on to a post, he would have done against Swansea. It was one hell of a strike and another sound performance from the France international. It would appear that Manuel Pellegrini is happy to play the Frenchman more often these days. It will be very interesting who is selected against Bayern Munich in the Champions League in a massive week for the manager and the club. What are Newcastle doing fifth in the table and looking good for it? Fabricio Coloccini has been instrumental in reviving their fortunes and featured regularly in my team of the week. However in the absence of their club captain and, suffering with a list of injuries for the game against QPR, Moussa Sissoko took over the role of skipper and led the club to another superb victory. His goal wasn't bad either. Matic completed 94% of the 96 passes he attempted against West Brom - only twice has he completed more passes in a Premier League game. The game against West Brom was so utterly one-sided I had some difficulty selecting an outstanding performance by a Chelsea player. It was just as well that Nemanja Matic caught the eye with his selfless running and game changing interceptions. The 'silent force' as I like to call him was once again at the heart of all things good about the Blues. Nothing flash or particularly exquisite but just bog standard hard work. For all the game's paraphernalia, the one thing that has not changed is the rewards for sheer graft. He's been at Goodison since he was a lad and, rather like the great Evertonian Colin Harvey, plays with enthusiasm and determination. He was the engine room for the Toffees, who found the going tough at times against West Ham. He started the move that provided the opening goal for Romelu Lukaku before racing the length of the pitch to finish off some wonderful work by Samuel Eto'o to provide the winner. An Everton elder statesman. Manchester United might have been over-run by Arsenal at times but, during the moments they were not, the link-up play between Angel Di Maria and Wayne Rooney became the Gunners' undoing. It was Di Maria's through ball for Rooney that cut Arsenal to ribbons and set the England captain for the winner. With a little more care in front of goal, the Argentine would have also been on the score sheet after another wonderful counter attack, but he failed to hit the target. Bolasie was impressive for his country in midweek and was outstanding against a beleaguered Liverpool who seem to be leaking goals. He made the first and second goals for the Eagles, who for long periods in this game just terrorised Brendan Rodgers's side. Another exciting winger playing for a club who have a reputation for fielding the likes of Wilfried Zaha and John Salako. Rooney won his 100th England cap against Slovenia, destroyed Scotland at Celtic Park before returning for club duty without fuss to put Arsenal to the sword. No one has scored more goals against Arsenal in the Premier League than the Manchester United maestro and I can't think of an English player in the modern game who has worked harder or deserves more recognition for his accomplishments. Congratulations Wayne, you've had a wonderful week.